I live right around the corner from the Monument at Vet’s Park across from the hospital. I knew that there were going to be some big renovations happening at the monument, but I was unprepared for what I saw as I drove by Tuesday afternoon. Virtually the entire base has been torn out, and it appears there will be a lot more work done. It will take most of the winter to get the marble back in place, fully repaired. According to the Mayor’s office, the work should be completed in time for Armed Forces Day on May 19, 2018. Seeing the work being done on the monument triggered some memories of growing up in that neighborhood, and I thought I might share a little history about the park and the obelisk. In 2006, the Niagara County Historians Office published a booklet, “They All of Them Fought Like Heroes” which detailed most of the veteran’s monuments around Niagara County. Much of the history will be coming from that booklet, which I helped to compile. Frank Byron sponsored a resolution on October 13, 1902, to acquire Lot N on East Avenue, known as the Douglass property, in a state tax sale. At the Common Council meeting November 3rd, the Council passed a resolution to set aside to set aside that property as a public park, and that the park should be known as “Bryon Park.” Despite being unanimously passed, a follow up resolution on November 10th eschewed the naming of the park as “Byron Park.” It was a split decision, 7-3, with Byron leading the fight to keep the name, but ultimately losing. Alderman Allen Few proposed on December 29th, that “the portion of Lot N, East Avenue which has been dedicated as a public park, be and the same shall be called East Avenue Park.” The resolution was passed unanimously. As early as 1924, plans were put into motion concerning the erection of a soldiers and sailors monument at East Avenue Park. The Lockport Men’s Community Club hosted a minstrel show to raise money for the project. The Men’s Club broached the subject over several years, bringing special attention to the subject in February of 1928. They believed that it would be a symbol of the city as a whole in recognition of the service of each solider, sailor and marine. An early design, based upon a similar memorial in Aurora, Ontario for Canadian soldiers, would have been constructed of Barre granite, nearly 75 feet in height, with a beacon at the top that would be perpetually lit in remembrance of those fallen service members. Congressman S. Wallace Dempsey assured the group that he would have several cannon added to the memorial once it was complete. Alderman O’Shaughnessy felt that a community hall which could be used by veterans and their families would be a better use of $5,000. Despite the misgivings by Dolan and O’Shaughnessy, both appreciated the efforts put forth by the Men’s Club, and the resolution adding the money to the 1930 budget was unanimously passed. On May 24, 1930, John T. Symes, Treasurer of the Fund Committee, announced that $25,222.76 had been raised, and he requested the promised funds from the city. The Council agreed, but added another caveat – the monument needed to be completed within one year, or the money had to be returned. Ground was broken on August 11, 1930. Memorial Arts Company of Buffalo was awarded the contract. The space required for the foundation measured about thirty square feet and just over six feet deep so that it would rest on solid rock. On August 26th, the foundation was complete, larger than originally anticipated. It was still thirty feet square, but fell to a depth of ten feet to ensure it could hold the weight of the Georgia marble. All the marble was on site October 24th, ready to be formed into the monument. Anticipation was that the new memorial would be dedicated on Armistice Day that year, with Governor Franklin D. Roosevelt invited to the occasion. Due to delays in construction and weather concerns, the November date was passed up in favor of another date. It was suggested that the dedication could be part of the 1931 Independence Day celebrations. Again, that date was considered to be too soon. It was expected to be dedicated at the bicentennial of George Washington’s birth in 1932, or sometime in 1933. There was good news amid all the turmoil. The monument was lit for the first time on June 8, 1931. A 200-candlepower light shone from the top of the shaft and colored lights played off the dancing waters of the fountains at the four corners of the monument. The colors in each of the fountains were red, white, and blue. These colors also reflected off the marble at the base of the obelisk. The lights were controlled by a clock that would turn the lights on and off each evening. Interestingly, it was reported that the Community Club had a bronze box, filled with historical items, which was to be placed in the cornerstone of the monument. At a Common Council meeting, March 20, 1933, the Club explained they had the box and were formally tendering ownership of the memorial to the City of Lockport. When I spoke to the contractor who worked on refurbishments in 2005 and in 2017, he said he knew of no time capsule, nor had he found any evidence of one. Further research does not tell the tale of this mysterious bronze box. Raphael Beck designed the Veterans Obelisk in 1929, using his daughter, Phyllis, as the model for the statue. Born on November 16, 1858 in Lancaster, PA, Beck was named Raphael after the Italian Renaissance artist. His father, Augustus, was a sculptor as well as a painter who received the contract for the bas-relief on the interior of the Washington Monument. He also designed the fireplace mantles in the White House. Beck learned painting from his father and then traveled to Munich and Paris to further his education. Upon returning to America, he lived in Lockport, and took trips to the Netherlands, Venice, Switzerland, and Paris for advanced study. Beck painted the large mural depicting the opening of the Erie Canal on the wall of the Lockport office of the Manufacturers and Traders Trust Company. It was later taken to the Lockport High School Auditorium, where it was glued to the wall. He won first prize at three international expositions and earned many other honors. Beck maintained a studio in Buffalo, commuting daily. Each year on his birthday he walked the 23 miles from his home on Willow Street to Buffalo. When President McKinley spoke at the Pan American Exposition in Buffalo in 1901, Beck sketched him as he spoke to a crowd of 50,000 near the Triumphal Bridge. With just the initial sketches completed, Beck left for New York City for business, where he learned of the President’s death by assassin. He immediately completed the portrait President McKinley Delivering His Last Great Speech at the Pan-American Exposition, Sept. 5. 1901. The portrait was hung in the US Senate for many years, and is now the property of the Buffalo History Museum. 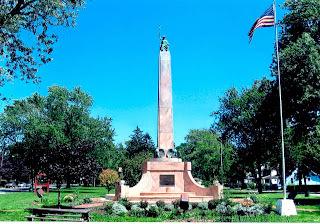 The monument is a very large, pink Georgia marble obelisk and base, standing in the center of Veterans Park. The base consists of a circular two-step dais bisected by a substantial square plinth. A Latin motto, based on Horace’s Odes is carved into the stone. “Dulce et decorum est pro patria mori,” which means, “There is no greater honor than to die for one’s country.” On each side of the of the plinth are bronze tablets. Above them and below the obelisk are four large bronze eagles standing at each corner. The spire is topped by a statue of Lady Liberty seated 40 feet above the ground. She grips a staff with a rectangular sigh inscribed “Lockport” with a small eagle atop and a tassel below. A World War I helmet rests on her head. The eastern and western plaques are authentic to the monument. Originally the monument had fountains on all four corners and draped bronze flags in two sides, but these were later removed – possible for a scrap drive. The Georgia marble chosen as the main building material came from Pickens County in northern Georgia, which lies at the southern end of the Appalachian Mountains. This area is renowned for its exceptionally pure marble which was employed by the Native Americans as early as 800AD. Georgia marble has been used in the construction of many notable buildings including the Lincoln Memorial, House Office Building, National Air & Space Museum, New York Stock Exchange Annex, and the Bok Singing Tower in Florida. The monument has been in almost constant need of repair since it was erected. At a Common Council meeting on March 20, 1933, it was reported that children playing on the monument had broken the mountings for one of the bronze eagles, loosened one of the fountains, and had broken all the lights in the bowls. The company who constructed it refused to do the repairs, stating that any further work was not in their contract. At the same time, the ownership of the structure remained in doubt as the City politely ignored the gifting attempt by the Lockport Men’s Community Club. Mr. Kinsley, the president of Memorial Arts Company of Buffalo, was appalled at the condition of the monument in a letter to the Common Council in October 1933. He was disgusted with the way the memorial looked. It started an argument among members of the Council. “I was driving through Lockport recently and I stopped to look at the soldier’s memorial which we erected a few years ago. It is only natural that I should take a decided interest in any work which we have erected, and I am putting it very mildly when I say I was thoroughly disgusted with the condition of so beautiful of a memorial. In the first place instead of it being an asset to the city of Lockport, in its present condition it is a decided eyesore. There is a statement somewhere in print to the effect that people of a community are judged by the memorials they erect in memory of their heroes and defenders. This memorial was in perfect condition when it was turned over to the committee. It is, of course, necessary that the joints be repointed at intervals. This is true of every public memorial which has ever been erected or any structure of its nature. It has been brought to my attention that the children of that vicinity use it as a playground. In fact, while I quote only from hearsay, there must be some truth to the following statement: On last Fourth of July, some of the children removed the rosettes from the memorial and used the openings to shoot their firecrackers. They ride the eagles, and in general, use the monument as a gymnasium. Alderman Donald G. Jones erupted when the letter was read. Considering the monument was not quite three years old, damage to the joints should have been minimal. He stated during the meeting, “That man should be ashamed of himself. It was never put up right. Either they didn’t use the right kind of filler or else they didn’t put the filler in right.” He added that the company should make the necessary repairs immediately. Despite the uproar, neither the city nor the builder deigned to undertake any repairs. Throughout the spring of 1934 into late summer, the monument was roped off by the Streets Department for safety reasons. For the winter, the obelisk was wrapped in waterproof paper to keep water from seeping into cracks and furthering damage. By 1935, repairs were still on the table. A work crew from the WPA did the minimal work at the worst of the damage. During the evening of May 26, 1936, a large slab of marble fell from the monument, shattering on the base below. The fallen piece exposed the bricks that made up the interior of the shaft. It was speculated that a lightning strike could have dislodged the stone. Spanish-American War veterans approached the Common Council on June 15, 1936, demanding that the monument be torn down. According to William J. Hooper, adjutant, all the members of Lockport Camp 83 agreed that the memorial was unsightly and disrespectful to the memories of the fallen soldiers, sailors and Marines. A week later, members of B. Leo Dolan Post 410 stated that they believed the shaft should be razed while the base remained as a compromise to tearing the whole thing down. The Common Council approved during recess action on October 13, 1936, to hire W.H. Pikey & Sons, of Buffalo, to dismantle the shaft of the memorial and crate it for protection over the winter. In the spring, Pikey would be employed to make repairs and rebuild the shaft. Pikey declared that the whole structure was not built to specifications. He said that the combination of wind sway and the excessive two-and-a-half-ton cap contributed to its rapid deterioration. Pikey’s plan entailed razing the shaft down to the base, crating the pieces worth saving, and then building a new shaft in the spring. The updated shaft would be solid. The Georgian marble slabs would then be attached to this solid shaft. The costs for this work would be $2,800. He showed the aldermen that the construction should have been concrete rather than brick and mortar, and he wasn’t sure if the same shortcuts were taken in the construction of the base. On October 1, 1975, the Council was informed of the deteriorated condition of the Monument in East Avenue Park. It was indicated that further investigation was necessary to determine if there was a foundation and if there was, the condition of it. a. There is a foundation under the Monument to a sufficient depth to provide frost protection. b. The upper portion of the foundation around the outer edge has deteriorated. c. Due to freeze-thaw cycles, the outer ring of stone has been pushed out beyond the foundation 2 to 4 inches. d. The entire Monument is in need of caulking and cleaning. It is the recommendation of the Engineering Department, that the outer ring of stone be removed and the deteriorated portion of the foundation also be removed and replaced. Also, the foundation should be extended at least 1’0” wider than the existing foundation to support the portion of the outer ring of stone that has moved outwards. It is our opinion that the entire project should be put out to bid, including cleaning and caulking. A very rough estimate at this time would put the cost at $10,000 to $12,000. If there are any questions, please contact me. Allan R. Rutter, Acting City Engineer. Through a fine spirit of co-operation and participation by the 102nd Engineering Battalion, Bricklayer Local 15, Labor Local 91, and Municipal employees Local 855, the renovation of the Soldiers and Sailors Monument is in its final stages. The generous monetary donation of the Navy-Marine Club of the City of Lockport has purchased material, and the remaining balance should cover approximately one-half of the cleaning and caulking necessary to complete the renovation. I would request that the Common Council authorize the remaining amount necessary to match the Navy-Marine Club’s donation, (should other donations not be forthcoming), and it be taken from Account No. A.1990, Contingency. It is estimated that $1,550.00 will suffice for the City of Lockport’s contribution. 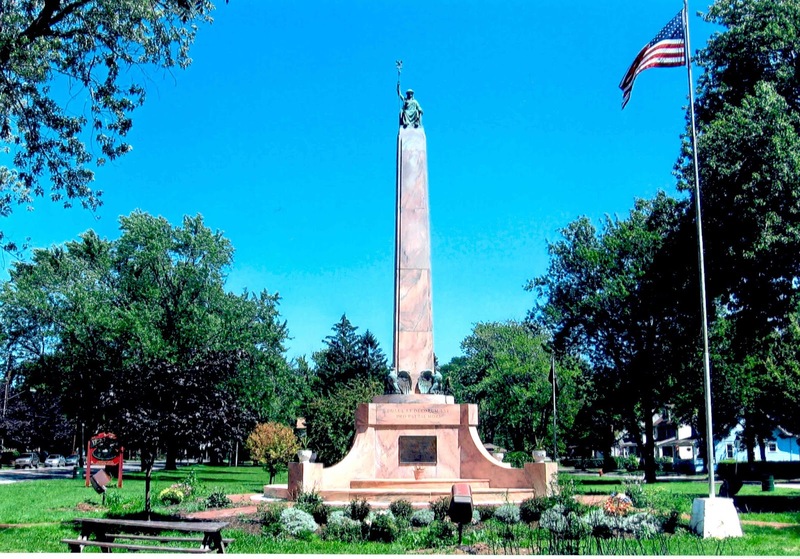 This monument was erected in 1930 by solicitation, and it was originally estimated that contractual expenses would have cost the City of Lockport approximately $13,000.00 for renovation to its original condition. The final cost to the City of Lockport is representative of the time and effort exerted by so many, accomplishing this worthwhile civic project. James Budde, an alderman who lived across the street from the park and the monument, went on a one-man crusade to fix the obelisk once again in 1981. He addressed the Common Council, asking that it be refurbished, and the fountains and lights be restored. Mayor Rotundo put Budde in charge of a committee to supervise the project. It took four months to complete. The City decided to change the name of East Avenue Park in 1985. It would be named Veterans Park while the original Veterans Park on Elmwood Avenue would be changed to Joseph E. Kibler Park. All the monuments at the old park were removed to East Avenue to accompany the towering spire of the Beck Monument. In 2005, the monument was again in need of repairs. The community donated $80,000 towards the project, and a Veteran’s Walkway was added around the base, consisting of bricks inscribed with the names of local veterans. The walkway was extended in 2006 to branch out from the base to both LeVan and East Avenues. During the rededication on May 31, 2005, Phyllis Beck VanDeMark, aged 96, arrived with her grandson, US Marine Sergeant Adam VanDeMark, pushing her wheelchair. They had arrived at the monument in the “Junior R,” A one-of-a-kind, green and black, four-door convertible automobile built at Harrison Radiator in 1923. Mrs. VanDeMark’s father designed the monument, and it is her likeness portrayed in the face of Lady Liberty at the peak of the spire. At the ceremony, thirteen-year-old Allison Bartkowiak played “Taps” and a KC-135 Cargo fuel plane flew over just as the statue was being rededicated by Commander Michael F. Lombardi. Mayor Michael Tucker served as Master of Ceremonies. Members of the Middleport Rod & Gun Club, dressed in uniforms of soldiers from the French & Indian War, the Revolutionary War, and the War of 1812, joined the Marine Corp League in a rifle salute. When the work was being undertaken in 2005, it was noted that there was a lot more damage than had been initially thought. City leaders knew at that time that it was only a matter of time before they would have to commit to a more thorough refurbishment. In October 2017, work began to fix those earlier issues with a longer lasting solution. The expectation is that by May 2018, the outer steps of the base will be reset, the marble blocks will be reset, resealing the entire structure, repairing cracks on the marble, cleaning the entire monument, and adding a light to the top of the statue will be complete. The monument has stood sentry along East Avenue for 87 years. It’s had more than its share of issues with deterioration, but through it all, it has honored the men and women of Lockport who served in the armed forces of the United States and never made it home. While researching for this article, I discovered a lot more about the monument than I ever knew before, even after researching for the book that the Historian’s Office published. I knew there were once fountains at each corner, but I never knew that there were red, white, and blue lights playing on that water as it flowed each night. How wonderful would it be to reintroduce that aspect back to the memorial? I know the city doesn’t have the funds to do that intensive of a project right now, but if the citizens of Lockport could raise $30,000 to build it while suffering through the first year of the Great Depresssion, we can do the same today. Maybe we won’t be able to get it included in this round of renovations, but maybe someday. It could be a goal that we work towards – working fountains and lights. It would be just like Raphael Beck designed in 1929. On this day, ninety-nine years ago, the guns finally fell silent to end the War to End All Wars. The Great War was over. In 1919, Congress declared November 11th to be Armistice Day to remember all those who had perished in World War I. In 1954, it was renamed Veterans Day to honor all veterans of all wars. Today we remember all those men and women from every war. That includes making sure the memorials left to remind us of them are not forgotten either. We Lockportians look with pride at our beautifully designed monument on East Avenue. It reminds us of all that we have to be thankful for, and hopefully transcends the petty bickering that so often becomes part of our social discourse. We should take the time to pause a moment at, not only this memorial, but also at the many others around the community. We should take the time to thank the people each of those stones honor. We should make sure that their stories are never forgotten or be allowed to crumble. Craig Bacon is the Deputy Historian for Niagara County.